At Vision Trends Eye Care, we provide a wide range of eye care services. We are pleased to offer the following optometry services to our community. An eye exam in our office is a thorough evaluation of the eye. It is also a determination of prescription for glasses or contact lenses. LASIK surgery is permanent and selecting the right surgeon can be a daunting task. We are blessed with a large selection of LASIK surgeons and centers but which one is best for you? The quality of LASIK is directly related to the technology utilized and the surgeon’s skill. We select the best surgeons to work with that have a track record of excellence and reliability. We perform the pre and post operation evaluation in our office while the surgery itself is performed at the surgeon’s office. This way you have an unbiased second opinion regarding the outcome of the surgery and we can manage any complications effectively. This arrangement allows us to extend a much lower price for the newest technology available. A totally blade-free procedure for $2,000 per eye, that includes a full one year warranty on the LASIK. If you have any questions about LASIK come in for a comprehensive eye exam. Already had LASIK? If you had LASIK a few years ago and not seeing as well it is extremely important to have your eyes examined yearly. The incidence of eye disease is not altered by having LASIK and yearly eye exams are the only way to ensure optimal eye health and vision. The most common cause of vision loss for children is an easily detectable and treatable condition. Ambloypia, a condition where the central vision in one eye does not develop properly, affects up to 3% of children and it causes permanent vision loss if not treated when the child is young. Children learn mostly through their eyes and their visual needs are different from those of adults. Their eye exams differ too with a focus on functional vision skills like eye movements, alignment, depth perception, color perception and flexibility of their focusing ability. The American Optometric Association recommends at least one eye exam before a child starts school to detect any eye conditions in a timely manner and allow for proper treatment. School nurses and pediatricians do an excellent job detecting myopia and some vision related problems; however, only a thorough eye exam that includes the dilation of the pupils to relax the focusing muscles will ensure that they visual system is functioning properly. 20/20 vision is not an adequate measure of the function of the eyes for kids. Not all children that want glasses need glasses, prescribing glasses for children that do not need them may harm their visual development. If your child is having a problem with learning, ruling out the eyes is the first step to answering some of your questions and getting the child the proper treatment plan. Fitting children with glasses is complex and requires the ultimate care and perfection at every step. Unlike adults, children may not notice anything out of the ordinary if their glasses are made incorrectly. Unfortunately, glasses that are made incorrectly can affect the performance of the child or cause the eye to become more nearsighted. 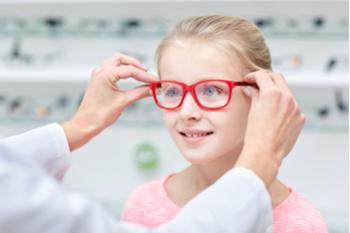 At Exceptional Eye Care we do not have any quotas to meet or sales goals like large retailers do and we place your child’s visual well being first. Fitting children with glasses is complex and requires the ultimate care and perfection at every step. Unlike adults, children may not notice anything out of the ordinary if their glasses are made incorrectly. Unfortunately, glasses that are made incorrectly can affect the performance of the child or cause the eye to become more nearsighted. At Vision Trends Eye Care we do not have any quotas to meet or sales goals like large retailers do and we place your child’s visual well being first.